Born Joseph Melchior Sarto on June 2, 1835, this remarkable man described himself in his will, “I was born poor, I lived in poverty, I wish to die poor.” His place of birth was the little village of ‘Riese in northern Italy. His parents nine other children, two of whom died in infancy. When the father, a cobbler, died, the mother supported herself and the children by the work of sewing and the products of the small farm. 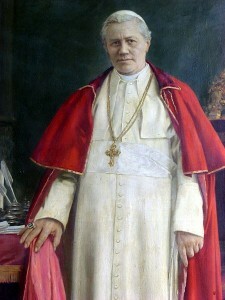 After attending high school, Joseph Sarto went on to the seminary at Padua and was ordained in 1858.